This stockade housed hundreds of convicts constructing the famous Mount Victoria Pass which opened in 1832. The stockade site is at the foot of Mt Victoria Pass, NSW. It is one of a series of stockades in the Lithgow area of NSW (see map), housing convicts involved in the construction of the Mitchell’s Road to Bathurst in the 1830s. In addition to a tall stockade fence built from upright stakes to enclose the convicts, there once were barracks for the soldiers, constables’ huts, a cottage for the officers, a Commandant’s house and a store house on this major site. Mt Victoria Stockade was broken up in 1833 after Mt Victoria Pass was made trafficable and convicts were moved on to other sites along the road such as Mt Walker, Bowens Hollow and Hassan Walls stockades. However, Mt Victoria Stockade was later re-established to allow repair work to be done to the walls of the Pass. Ollie Leckbandt rediscovered the site of Mt Victoria Convict Stockade with Tom Skeen following a detailed search of the area. Artefacts found on the site included coins, buttons, musket rounds, buckles, tool fragments, china, bottles and clay pipes. Ollie has documented these relics and explained their history in his book, Convict Stockades from Mount Walker to Mount Victoria. This book also provides site photographs, maps and historical notes about the stockade. A man and woman with a sulky and driver pose in the afternoon light on Mitchell’s viaduct, also known as the second bridge, on Victoria Pass. Note the massive convict-built masonry walls and buttresses of the causeway across the gully. Photo credit: Image by Katoomba photographer Harry Phillips, from about 1910. Blue Mountains City Library Local Studies Collection. The improved line of road to bypass the steep tracks at Mt York was surveyed by Thomas Livingston Mitchell in 1830 and named by him Victoria Pass. In February 1832 there were nearly 400 convicts working on the Pass and its spectacular stone causeways. It was opened on 23rd October 1832 by Gov. Bourke. In 1836 Charles Darwin travelled to Bathurst and called it ‘worthy of any line of road in England’. Except for a brief period between 1912 to 1920, when early automobiles preferred the easier grade of Berghofer’s Pass, Victoria Pass has remained the principal route of access to the west. “It was not until 1813, twenty-five years after the colony was founded, that a primitive road was hacked through the dense bush and rugged sandstone ridges, opening the western plains to settlement. Convicts laboured and lost their lives building that road, moving thousands of tonnes of rock with picks and shovels and constructing stone bridges as strong and dependable today as they were nearly 200 years ago. The steepest section of the road wound up and over Mount York, but the danger of accident was so great that an alternate route (only slightly less precipitous) was opened and Victoria Pass came into being in 1832. Modern travellers speeding along the smooth black ribbon that is the Great Western Highway give little thought to the perils, physical and otherwise, that lurked at Victoria Pass. 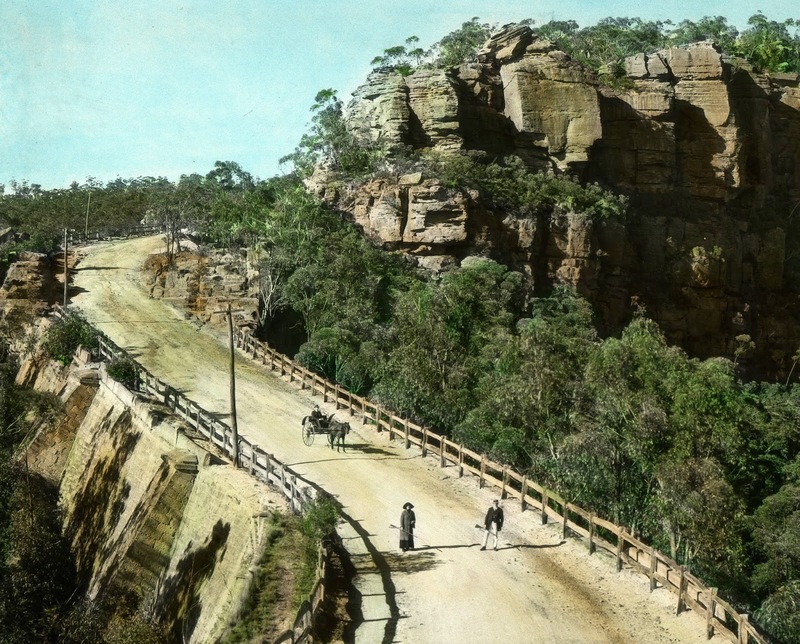 In earlier times it was quite a feat to climb to the top and ascend the other side without mishap or delay and, if travelling at night, there was the added risk of encountering the Ghost of Victoria Pass, which haunted the second bridge on the eastern side. Travellers reported that their horses would become restless as they approached the bridge, then the figure of a young woman dressed entirely in black would suddenly appear in front of them. Some reported that her long, dark hair streamed out in the wind and that her arms were raised in a suppliant gesture. Some said that her eyes shone in the dark like a tiger’s and a few said that she was headless. As suddenly as she appeared the spectre would disappear, leaving travellers anxious to put as much distance as possible between themselves and the scene of their harrowing experience. History can put a name to this ghost. She was born Caroline James, and at the time of her death she was Mrs William Collits. Caroline came from a shady and unstable family; her father ran a sly grog shop and her drunken mother had hanged herself. Despite this unsavoury background Caroline married into a respectable family: the Collits, proprietors of the inn at Hartley Vale. Unfortunately for Caroline, the Collits who took a fancy to her was the black sheep of the family, William, described by his father as a ‘spendthrift idiot’. William Collits and Caroline James were married in 1840, but their marriage was anything but blissful. Caroline’s younger sister was married to a thug named John Walsh, who was Caroline’s as well as her sister’s lover before and after their marriages. When her new husband turned out to be a poor substitute for Walsh, Caroline left him and moved in with her accommodating sister and brother-in-law in a menage-a-trois. There was talk of reconciliation between Caroline and William in the New Year of 1842. They met, along with Walsh, for a drink in Joseph Jagger’s tavern near Hartley, but soon after leaving the tavern Walsh attacked William. Caroline came to her husband’s aid by holding Walsh’s arms and screaming to William to run for his life – which he unhesitatingly did. At about 6 am the next morning the postman delivering mail to Hartley came upon the battered body of Caroline Collits beside the road on Victoria Pass, about five kilometres from Jagger’s tavern. Her skull had been smashed with a large stone which lay, stained with her blood, nearby. John Walsh was arrested for her murder but pleaded innocence, accusing not William Collits as you might imagine but Joseph Jagger, the tavern keeper, of committing the heinous crime. The jury at Walsh’s trial did not believe him. He was convicted and hanged at Bathurst on 3 May 1842. William Collits remarried seven months after Caroline’s murder and lived a long and happy life. His family achieved posthumous fame in the 1930s when they and their inn became the subject (with much alteration of fact) of the first successful musical comedy entirely written and produced in Australia on an Australian subject – ‘Collits Inn’, starring Gladys Moncrieff and George Wallace. Needless to say, the black sheep’s branch of the family and this gruesome episode do not figure in the plot. From: The Ghost Guide to Australia by Richard Davis. Bantam, 1988. Below is a contemporary newspaper account from 1842, the original spellings have been retained. “MOST of our readers are aware that there is a man named John Walsh, a freed man, at present lying under sentence of death, in Bathurst Gaol, for the murder of Caroline Collitt, on Mount Victoria, on the 3rd of January last. The case was tried before Mr. Justice Stephen, at the last Bathurst Assizes, when, after a lengthened trial, the Jury retired for about twenty minutes, and returned a verdict of guilty against the prisoner, when his Honor passed sentence of death on him, which is to be carried into effect at Bathurst, on Tuesday, the 3rd of May. The perpetration of this crime appears to have been marked with circumstances of peculiar atrocity, such as we believe have seldom been met with in the annals of crime ; and as the history of the case is fraught with unanswerable arguments in favour of the cause of temperance, we have collected the most material of them in the following brief sketch. Caroline Collitt, the person who was murdered, was, at the time of her death, about seventeen years of age ; she had been married about eighteen months to a man named Collitt, who was possessed at the time of their marriage of a considerable number of cattle, but is generally regarded as a person of weak mind. About twelve months after her marriage, her mother, who was a notorious drunkard, hanged herself in her own house, her husband being in the house at the same time, but so much in liquor, that he could not prevent her from destroying herself. He was taken up on suspicion of being a party to her death ; but after lying about six months in gaol, was discharged. About six months before the mother’s untimely end, a younger sister of Caroline Collitt married John Walsh, the convict at present under sentence of death in Bathurst Gaol, and, it appears, continued to live with him up till the time of her sister’s murder; but she, as well as her sister Caroline, since the trial, have been ascertained to have been very loose characters, which is fully established by the fact, that both before and after Walsh had married the younger sister, Caroline cohabited with him, and had in fact been for a considerable time living with him, under the same roof with her sister, and in a state of separation from her own husband (Collitt). It has also been ascertained, that just before she lost her life, she was on terms of intimacy with her husband, and intended to go and live with him again. John Walsh appears to be a native of Ireland, from which he was transported to this Colony in 1833, for seven years; he is about thirty years of age. Since his arrival he has been twice tried for murder, once before Sir James Dowling, in the year 1830, for the murder of a person named Crate, but was acquitted. He was again tried, before Mr. Justice Stephen, in 1839, on a charge of having murdered a woman and her son—a little boy. In this case he was also acquitted, on account of the character of the principal witness against him, coupled with the ingenious line of defence which he set up, and which bore a great similarity to that adopted by him on the late trial at Bathurst for the murder of his sister-in-law (Caroline Collitt). In the former case, it was established, by evidence, that the residence of the woman had been robbed of a keg of rum and some tobacco, and that she and her son had been beaten to death with a stick, which was found near their bodies, at a short distance from their hut. Soon after the murder, the prisoner took a native black with him to help him to remove the plunder from the place where they found it concealed in the neighbourhood, at the same time telling him that he had been told by some bushrangers where the property was concealed,—that they had done the robbery and committed the murder, but were afraid of being taken if they went to remove it. Some clothing was subsequently found concealed, which had marks of blood on it; and he accounted for the clothing which he had on when taken, by alleging that the bush- rangers had given it to him, in order that he might enable them to disguise themselves so as to affect their escape out of the district. So, in the case of Caroline Collitt, he pre- tended that four or five men had set upon him and the deceased, and after compelling him to quit her, and taking his clothes, they had murdered her. In the case of Collitt’s murder, it was proved, that she, her husband, and Walsh, were all in company on the evening of the murder, and had been drinking in a public house kept by one Jaggars, at the foot of Mount Victoria ; that although they were sober when they went there, he had been drinking previously, and while there, he took two glasses of randy, which intoxicated him, while the man Collitt drank one, but his wife had only some lemon syrup. About a mile from the place where the husband fled for his life, her body was found early on the following morning, the face and head covered with blood and bruises, and a frightful wound in the temple, which had penetrated to the brain. This had evidently been inflicted by a large sharp jugged stone, one corner of which fitted into the wound, and was clotted with blood and hair.